If you’ve been hurt, you’ve come to the right place. 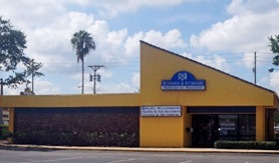 Serving Tampa, Hudson & Clearwater. 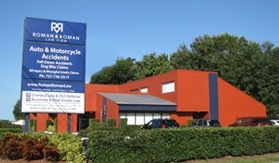 Since 1985, Roman & Roman has helped literally thousands of people like you who came to us for help with their legal needs. Although our primary practice area is personal injury law, many of our clients rely on us to resolve their other legal matters as well. With us on your side, you will have a strong, thorough and aggressive advocate to represent your interests. Our one-on-one approach to serving you provides the comfort and confidence you need at this difficult time in your life. Our meticulous planning, preparation and research are necessary to maximize the financial recovery you deserve. Ours is a family firm with four attorneys on staff: Thomas A. Roman, Paula C. Roman, Peter T. Roman and Michael R. Lentini. We take the time to listen and understand your situation. And we stay in touch after you have retained our services, keeping you informed about the progress of your case. And, because we are a family firm, every client is a client of the entire firm. 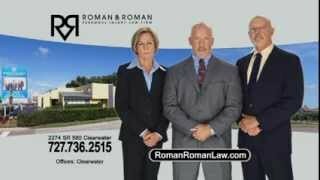 Whenever you need an attorney as a client of Roman & Roman, we’ll be there for you during and after business hours as well as weekends and holidays. 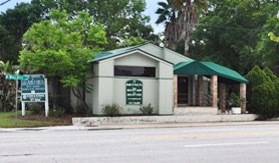 All four attorneys are licensed to practice law in the State of Florida. As a firm, we have the financial resources to stay the course on your behalf. We directly supervise skilled legal assistants, paralegals, investigators, case managers, photographers and others as members of your team. You will be glad to know that there are no fees or charges of any kind unless we recover money damages for your claim.